Our AmericaTowne® Import Trade Center facility provides a best-in-class export solution that allows you to Test the Market before expending funds for inventory. Additionally, during the Test Marketing program there is no significant expenditure for sales, marketing, human resources, inspections, and customs. The Test the Market Program is designed to test the market and secure orders. 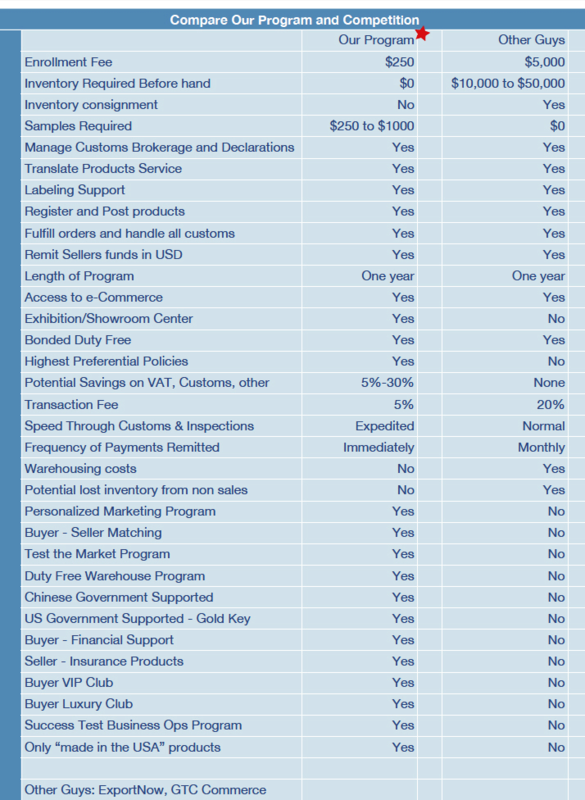 Only after an order is in hand and funds received from a qualified buyer do you ship inventory. In most cases, samples do not require extensive custom clearance or expenses for Value added tax (VAT) or customs tax. In addition to the 18,000 sq. showroom, 35 plus Chinese Evangelist staff with boots on the ground, and support by the government of Meishain Ningbo, coupled with an extensive buyer’s network supporting business to business sales and promotions, we have an innovative international e-commerce platform to support those sellers who want to sale business to consumer.